This is a Bird's Nest Sansevieria (Sansevieria trifasciata 'Hahnii'). It is in the same expanded clay pebble hydroculture setup as this tabletop Ficus tree. Those are polished decorative pebbles as "ground cover". You can see a couple of the brown clay pebbles peaking up. 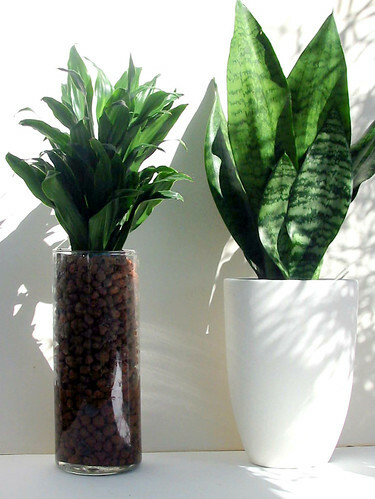 Sansevieria is a very durable indoor plant that will tolerate lower light conditions. It is also easy to propagate. This plant is a newly cut offset from another plant. The total out-of-pocket cost of this plant as pictured is about $5. This would be a great desktop plant for your office, or a gift for someone else's office. With desk lamp lighting like this it would likely need watering every two weeks or longer. The key is to check the water level with a pipette tube and only add more water when it shows that the water level is at empty. See more tabletop plants like this on Flickr. This blue glaze rice bowl caught my eye at Fei Long Asian Supermarket. It is bonsai quality for only $3.99. The little Ficus tree now has a new hydroculture home growing in expanded clay pebbles covered with decorative polished pebbles. There is no need for a much more expensive planter with a drain hole. Note the 1/2" diameter clear plastic pipette access tube. Simply insert a length of 1/4" tubing to the bottom, hold your finger over the top end, lift and see the water level. Add water only when empty. Plant care is that simple and virtually fool proof, keeping in mind that when dealing with living organisms nothing is totally fool proof. Hydroculture is probably as close as it gets. The tree was propagated last October from a bundle of cuttings held together with a rubber band. The propagator was a recycled soda bottle SIP with a deli container hood for holding humidity. The small caliper stems will fuse together over time to create a thick trunk. No pruning has been done at this point. I will prune the tree for bonsai type character at a later date. The houseplant market is a dying business in more ways than one. Why don't we have sustainable indoor plants like this available at retail? Why are houseplants essentially a feminine product. Surveys show 80% of the market with a large part of the remaining 20% purchased by men as gifts for women. A more masculine symbol tree like this could be a young boy's lifetime companion. Where Do Expanded Clay Pebbles Come From? There is an interesting ScienceDaily article about lightweight concrete after the jump. I believe it is the original use of expanded clay pebbles that eventually led to horticultural uses. Expanded clay pebbles known by many as LECA (Light Weight Clay Aggragate) are much more well known in Europe than in the U.S. Europeans use them in a very popular form of hydroponics known as hydroculture. The leca (generic use of the word) on the left is Hydroton and dominates the U.S. market in the world of hydroponics (mostly pot and orchid growers currently). The return on investment for you and your kid’s education is phenomenal with this idea. The bottle planters are more than free because you help the environment when you convert them to science education tools instead of tossing them into a recycle bin or the trash. A fashionable belief is that every school needs a dirt garden, a throwback to a bygone time of so-called “victory gardens”. What an extravagant and often wasteful idea. The no-cost bottle planters you make (along with other SIP variants) have the potential to teach your children more about science, the scientific method, botany, biology, physics, chemistry, nutrition and the environment that any dirt garden ever will. These bottle planters should be in every classroom in America. Every teacher (and parent) should know how to use them. Not just science teachers. Unfortunately, few teachers know about them and their educational potential. We can thank the USDA, the National Gardening Association, our land grant institutions and botanical gardens (aka collectively as “big dirt”) for that. The big question is whether you are motivated to do anything about it? Growing plants in "artificial soil" in sub-irrigated planter systems (SIPs) is really a simplified form of hydroponics. Few understand that an EarthBox is really a hydroponic planter. Look at this Flickr photo set. The design I advocate has a larger plant section and smaller reservoir than the design in the photos above. Pothos is a more low-light tolerant, durable plant than Swedish Ivy. It is what I would use. This experiment is meant as a fun introduction to hydroponics (or SIPs). We suggest that anybody new to hydroponics start with this experiment. You will learn (that) what you feed a plant matters more than what the plant grows in. We suggest Swedish Ivy /Creeping Charlie. This plant seems to grow no matter what – we even rooted this one in a coconut pound cake ! The roots will set from the nodes. Put the cuttings in a glass of water and wait for roots to appear (aprox 2-3 weeks). Empty 2 liter soda bottle, wick, fertilizer, plant, lemon or lemon juice, baking soda. Optional: pH test kit or litmus paper, straw, Lego blocks, shredded fabric, shredded paper. How much magic still remains in the Kennedy name? We may find out since Robert Kenndy, Jr. and Stephen Kennedy Smith have associated themselves with the Valcent VertiCrop hydroponic system. This video was my first opportunity to hear them both plug Valcent. I wasn't particularly impressed with these interviews but recognize that their family name still has clout in the marketplace. Have a look and see what you think. Are they persuasive? Left -Dracaena Janet Craig Compacta - clear glass vase (Walmart) Right - Sansevieria - ceramic planter (IKEA). This photo from my archives reminded me of my deck in San Diego where I could take pictures outside. The photo has obvious faults but I found the shadow patterns interesting. Both plants are growing in expanded clay pebbles, known widely as hydroculture. The pebbles are porous and have excellent oxygen holding characteristics. It is a very low maintenance method of indoor plant care. If not for the research I do, I would convert all plants to clay pebble hydroculture.